It's said that smell is the sense most closely tied to memory. I don't know how true that is but it strikes me as something that's entirely plausible. There are smells of all kinds that take me back to different places and times. 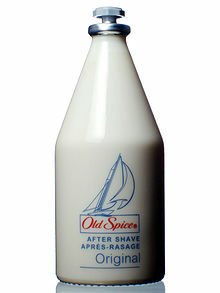 The first that comes to mind is this one, Old Spice. The scent of original Old Spice after shave will always remind me of my Dad. I can't imagine ever using it myself but that smell reminds me of him as much as the words "Macht schnell" do. Chanel Number 5 reminds me of my mother and Shalimar reminds me of my grandmother Stewart. The smell of polished wood reminds me of my Grandmother Anater's prized piano. Johnson's baby shampoo will always remind me of my nieces and nephews. The scent of light machine oil will always remind me of my brother Ray's coronet. The smell of baking bread reminds me of my sister Adele, even when the baking bread's in my own oven. Wintergreen reminds me of the Skoal my brothers Matt, Tom, Dave and Steve dipped incessantly. The smell of cow manure transports me back to my childhood home in Pennsylvania without fail, the scent of a pine tree right after a cool rain reminds me of my Ontario childhood summers and the smell of the ocean reminds me of afternoons at the Jersey shore. Old Bay seasoning reminds me of crab boils with neighbors when I was a kid and the smell of celery and onion sauteing means my mother and grandmother are about to make stuffing on Thanksgiving morning. Deisel exhaust reminds me of taking public transportation everywhere when I was in college and the smell of wet stone reminds me of Italy. Jasmine and Jacaranda remind me of Florida, my current home, and roses smell like my brother Tom's yard. Wood smoke smells like my brother Dave's apartment in Pittsburgh and stale beer smells like the bar I worked in a lifetime ago. Golden retriever smells like my brother Matt's homes over the years and that's a good thing. Steve's houses have always just smelled clean. My sense of smell and my scent memories remain with me permanently and there's not a day that goes by without my remembering a place or a time based on a whiff of something. As the day goes on, more and more bloggers will contribute posts and I encourage you to read aech of them. You and Ginny really have me wanting to visit the ocean again! I love Old Spice! Wow. You did a great job remembering scents. Thanks for the comments gang. Joe I love that story about your brother but then again I'm a sucker for brother stories, mostly because I have so many of them! My granda used to use "old Spice" too and I always think of him when I smell it. A lovely post. My husband is an Old Spice guy. Love their new campaign, including the line: "If your grandfather didn't use Old Spice, you wouldn't be here right now." Thanks Pat and Nora! Old Spice has a scent with an appeal that escapes me completely but I remember my grandmother and mother swooning whenever dad walked past. Old Spice reminds me husband of his grandfather (who he barely knew) so much that it's the only cologne he wears. I'm a Chanel No.5 fan, due to the many great women in my life who've worn it and it's great history. Chanel No. 5 is my my mother, through and through. Great post. I have a lot of olfactory memories too. For instance, the scent of Murphy's Oil Soap always makes me think of the church I attended in my youth. The scent of diluted white vinegar takes me back to lazy summer mornings when my grandmother would wash her windows with the stuff using old cloth diapers and newspaper. The smell of it was carried on cool morning breezes to where I was sleeping. Cherry pipe tobacco, even in the most efficient of whiffs, brings my maternal grandfather to mind.